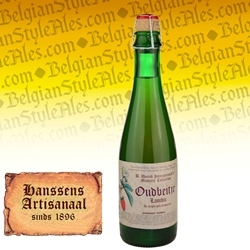 Oudbeitje (ABV 6%) from Hanssens Artisanaal is a lambic to which fresh Belgian strawberries were added during summer. It was then matured through the winter in oak barrels before being bottled in spring (our current stock was bottled March, 2016). It pours bright reddish gold with scant carbonation and almost no head. Tart strawberries are apparent in the aroma, along with earthy, cheesy, and vanilla notes. The taste is tart, sour, and dry, with an unmistakable strawberry fruitiness, though little sweetness. Ratebeer.com rating: 89 (out of 100); (corked) 12.7 oz bottle. Beginning in the late 19th century, Hanssens Artisanaal in Dworp, Belgium spent its first several decades brewing and blending (mostly) lambic style beers. Due to the seizure of the brewery by German occupying forces during WWI, owner Bartholome Hanssens was no longer able to sustain production as a lambic brewery, so he refocused attention on lambic blending. He purchased wort – the beer's sweet unfermented precursor – from other Senne River breweries, matured each acquisition individually, then painstakingly blended the resulting lambics together, and barrel aged the blend. 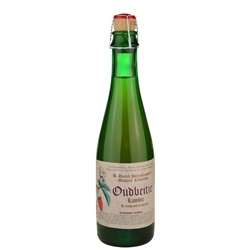 Today, Hanssens remains a traditional lambic blendery, producing only authentic, unsweetened, and unpasteurized lambics under a fourth generation of the Hanssens family.